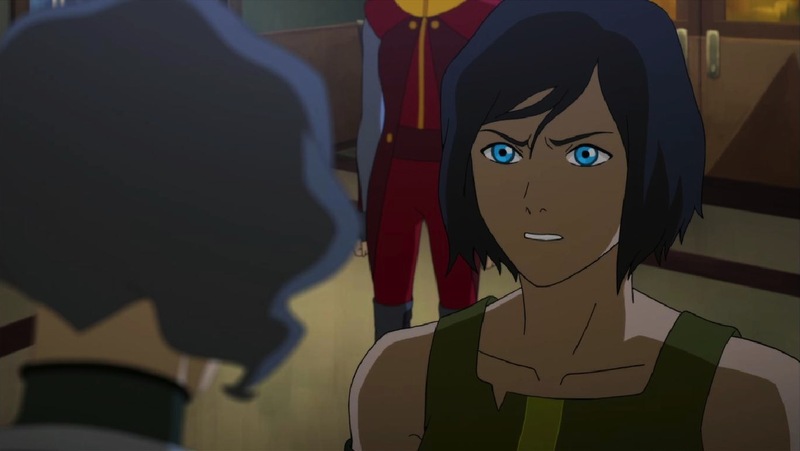 “Enemy at the Gates” whips through several compelling plot threads in The Legend of Korra. It also offers an affecting emotional arc while affirming one of the show’s major weaknesses: Bolin. Let me step onto my soapbox for a minute. Bolin (P.J. Byrne) is a terrible character. For three Books, his only purpose was to provide comic relief. And more than a third of the way into the final season, he shows no signs of growing up. The three year jump between seasons did nothing to dam the flow of his grating childish wit. 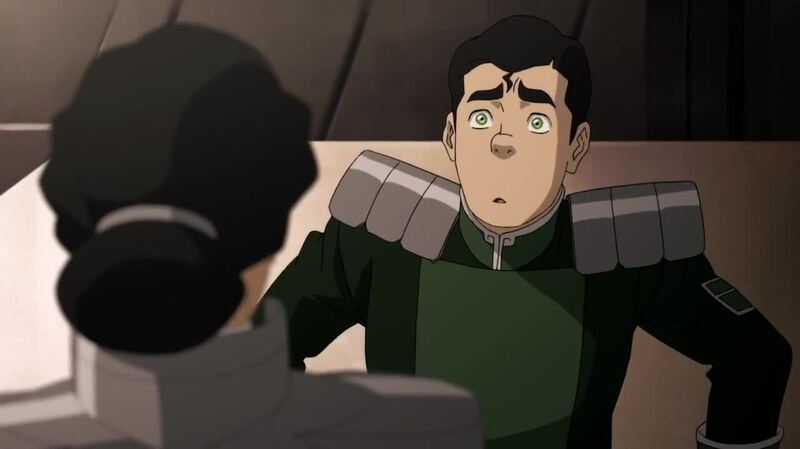 In “Enemy at the Gates,” Kuvira (Zelda Williams) calls upon Bolin to join the army’s “inner circle.” How does he react? He pumps his fist with an excited cheer, then looks sheepish before giving a more reserved response. Later, in an attempt to resolve tension between Zaofu’s leaders and Kuvira, he suggests everyone hold hands. I would be overjoyed if he would realize the gravity of these mounting conflicts and adopt a serious disposition. At this point, I’m sad to say that this will probably never be the case. Scenes stop dead in their tracks whenever Bolin opens his mouth. Amid the dark, serious problems Book Four has explored thus far, Bolin’s behavior doesn’t feel like comic relief. It’s just tonal incongruity. Taking on a fascist military leader doesn’t demand a balance of chipper humor – it requires poise and calm. Here’s hoping the writers find a satisfying way to evolve his character before the finale. At present, he’s only appeasing the ostensible kid demographic Nick is still trying to attract. Just as Korra reacts in horror to the news, the credits roll. The intensity is paced so masterfully that the abrupt ending comes as a complete shock. I was so fully engrossed in the episode that its conclusion felt disorienting. Despite getting cut short, Joshua Hamilton’s script makes this prelude a satisfying standalone chapter. He teases the impending flames by keeping them at a steady low smolder. Speaking of flames, we also got a fun sequence where Varrick (John Michael Higgins) and Zhu Li (Stephanie Sheh) film a spirit vine experiment that quickly goes awry. It turns out this might be too unstable to use as a source of power. After overloading Varrick’s machine, the vine releases a massive energy blast that blows out the back of the train car. Varrick grows wary of the devastating potential of his work, but Kuvira forces him to continue the project. She wants this energy source weaponized. If she succeeds, will she have the power to decimate cities? To kill the Avatar? The mysterious new technology will almost certainly play into a some larger scale battle later in the season. 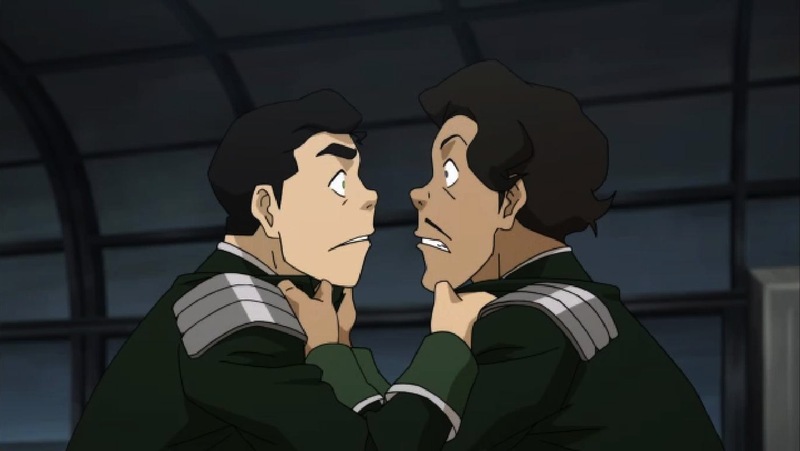 Zhu Li and Varrick’s odd relationship gets some welcome attention in this episode. Their dynamic almost skews romantic when Varrick saves her from falling from the blown-out train car. But just as they close in for a kiss, Varrick subverts expectation, reverting back to his ungrateful, demanding self. The moment foreshadows Zhu Li’s surprising betrayal in the final moments of the episode. Meanwhile, in a show of some Republic City-level detective work, Bolin wakes up to the fact that he’s working for a fascist and enlists Varrick and Zhu Li’s help to escape. They flee to the woods outside the city in mecha tanks, but Kuvira’s forces quickly catch up in battle suits of their own. The resulting fight is electrifying and brilliantly animated. The computer generated suits are integrated seamlessly into their hand-drawn environment. The runaways are defeated and captured and Varrick again takes his anger out on Zhu Li. She finally breaks. She renounces her boss and pledges her loyalty to Kuvira. 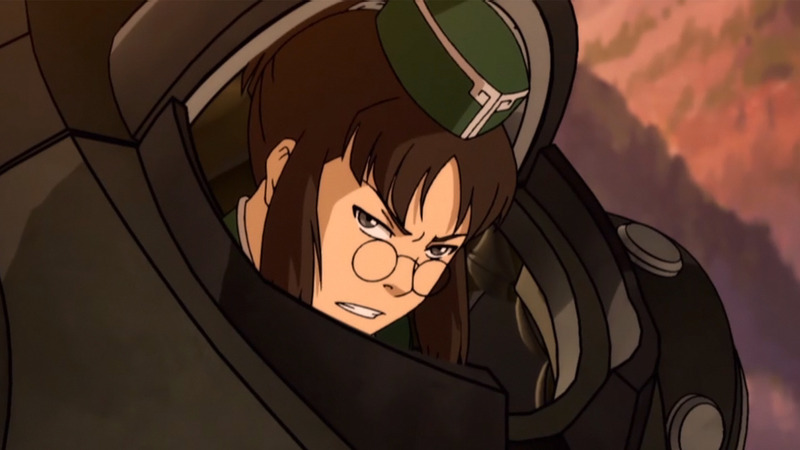 As frightening as it is to see Kuvira gain another ally, it’s impossible not to empathize with Zhu Li. The writers have added a realistic dimension to her character by bringing her anger to its hilt. It remains to be seen if she’s breaking bad here, but either way, Zhu Li’s statement to Varrick was clear. “Enemy at the Gates” matches this negative catharsis with a positive one. Asami (Seychelle Gabriel) visits her father, Hiroshi (Daniel Dae Kim), in prison and tells him she never wishes to see or speak to him again. She then takes a walk through Avatar Korra Park and sees a father playing Pai Sho with his daughter. The sight inspires her to try to make amends, and she returns to play Pai Sho with her father. The parallelism is far from subtle, but it allows a simple, touching moment of reconciliation. It also brings a glimmer of hope to this otherwise pulse-pounding, foreboding episode. Hiroshi hasn’t been seen since Book One. He was a major antagonist then, so this sudden reappearance invites speculation over whether he will play into the larger plot of Book Four. Emotional and political tensions are at their breaking point. “The Battle of Zaofu” promises to be a brutal one. Don’t forget to subscribe to Ember Island Airwaves, our podcast series where Søren and Josh discuss The Legend of Korra in-depth.